Fred Astaire was, and continues to be, one of icons of the movies. After a great career onstage, Astaire began making films in the mid-1930s, initially at R-K-O, where he was paired with Ginger Rogers in a string of great musicals. He then moved to M-G-M in the 40s and 50s, where he headlined in almost all of his films. Gracious, fun, and hard-working, we don't know anyone who didn't want to dance like Fred Astaire. Born to German/Austria immigrant parents, Fred's father relocated to Omaha in search of work as a brewmaster. Fred's mother sought to escape from Omaha, teaching her daughter Adele how to dance and sing. Brother Fred was included at an early age; he could dance and sing, but also played piano, clainet and accordian. Fred simply mimicked Adele's dance moves. The family moved to New York in 1905 in order to begin Adele and Fred's careers in showbiz. Intensive training followed, while the family name was changed to "Astaire." The two children made their debut in a small theatre in Keyport, New Jersey. Fred wore a top hat and tails in his very first professional appearance. They would become his trademark. Adele and Fred Astaire played the Orpheum circuit until Adele's height became a problem — the pair looked funny together. They took two years off the road until Fred's height caught up. By the time he was fourteen, Fred had become the act's musical director, where he met and formed a working friendship with composer George Gershwin. Fred was continually looking for the newest songs and dance steps, which he and Adele practiced with great rigor. The Astaires made their Broadway debut in 1917, in a patrotic revue called Over the Top. Adele continued to be the "senior partner" of their act, with Fred providing solid support. They appeared together in many musical revues both in New York and in London, before making a screen test for Paramount in 1928. Paramount did not offer the duo a contract, however. They continued performing together until Adele's marriage in 1932 broke up the act. On his own, Fred teamed up with dancer Claire Luce and composer Cole Porter and scored a major smash with the musical play Gay Divorce, intorducing the song "Night and Day." After this, Fred was given another screen test at R-K-O, whose boss at the time, David O. Selznick, signed him up. His first film for that studio was Flying Down to Rio (released in December, 1933), where he danced some numbers with a young lady named Ginger Rogers. Despite being reluctant to become identified with another partner, Astaire and Rogers would make nine films (including Flying Down to Rio) together, each of them smash hits — world-wide: The Gay Divorcee (released in October, 1934), Roberta (rerleased in March, 1935), Top Hat (released in September, 1935), Follow the Fleet (February, 1936), Swing Time (released in August, 1936), Shall We Dance (released in May, 1937), Carefree (released in September, 1939), and The Story of Vernon and Irene Castle (released in March 1939). Looking for new horizons, Astaire left R-K-O, and partnered with Eleanor Powell in Broadway Melody of 1940 (which played the Chinese in February, 1940). Then he made two pictures with Rita Hayworth: You'll Never Get Rich (released in September, 1941), and You Were Never Lovlier (released in November, 1942). The failure of Yolanda and the Thief (released in November, 1945) convinced Astaire that his day was over; he announced his retirement in 1946. That didn't last long. M-G-M producer Arthur Freed asked Astaire to take over for an injured Gene Kelly in Easter Parade (released in July, 1948). After that, Astaire would re-team with Ginger Rogers for The Barkleys of Broadway (released in May, 1949). His films at M-G-M oscillated between hits and flops; Three Little Words (released in July, 1950), and Royal Wedding (released in March, 1951) were hits, while Let's Dance (released in November, 1950), and The Belle of New York (released in February, 1952), were flops. A career milestone was 1953's The Band Wagon (released in August, 1953), which was a hit, but such an expensive production that it was a wash financially. He was let go from M-G-M.
Astaire set up his next project Daddy Long Legs at Fox, but during pre-production, Astaire's wife of 21 years, Phyllis, died of lung cancer. Composer Johnny Mercer convinced Astaire to shoot the movie as a way to handle his grief (the picture played the Chinese in May, 1955). Astaire continued to make musicals: Funny Face (released in February, 1957), and Silk Stockings (released in July, 1957), but times were a-changin'; he gave his first straight dramatic performance in On the Beach (which played the Chinese in December, 1959). 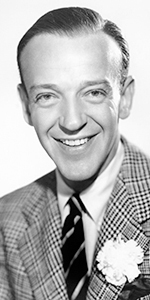 Fred Astaire produced several specials for television, winning multiple Emmy's for An Evening with Fred Astaire (1958). His last musical film was Finian's Rainbow (released in October, 1968). A role in The Towering Inferno (released in December, 1974) brought him an Oscar nomination, which was followed by many television apprearances, television movies and the occasional feature film. A life-long horse racing enthusiast, Astaire wed jockey Robyn Smith in 1980. They had seven years together before Astaire died of pneumonia in 1987. He was 88. Grauman's Chinese Theatre, Hollywood, California. 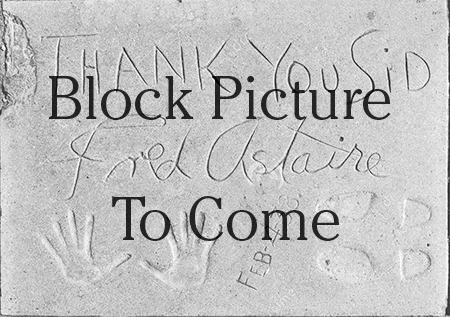 Fred Astaire Forecourt ceremony, Friday, February 4, 1938. 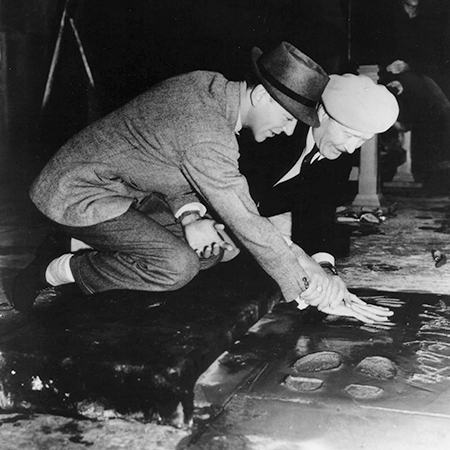 Fred Astaire has his hands pressed into the cement by cement artist Jean Klossner.